Mutant Rabbit On The Loose? The rabbit actually has a common skin disease called Shope papilloma virus, but I have yet to find online or anywhere else with a rabbit as worse as this. MANKATO, Minn. (AP) — A southern Minnesota college student's spoof video of an apparently tumorous rabbit that he dubbed "Frankenstein" has attracted hundreds of thousands of Internet viewers. 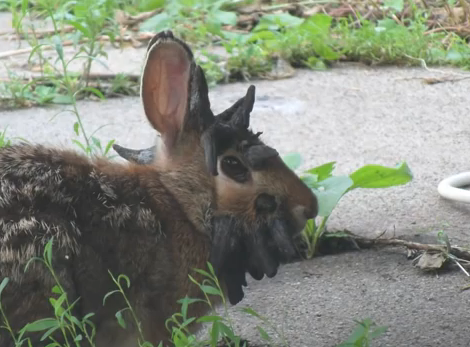 Gunnar Boettcher, a 20-year-old student at Gustavus Adolphus College in St. Peter, and his brother took photos and video of the rabbit, which looks to have tumors growing on its head, on June 26. "We've seen it before around the house but we've never been able to get a close look," Boettcher said. "But we went over to him that day and he didn't run away like he normally does." In the video, entitled "The World's Scariest Rabbit," Boettcher speaks in an Australian accent, imitating the late crocodile hunter Steve Irwin. Boettcher last saw the rabbit Wednesday night. He thinks it might have a papilloma virus that's a form of cancer.